(Dec. 12, 2017) – World Taekwondo today confirmed Guinea-Bissau Taekwondo Federation as its 209th Member National Association (MNA), as it continues to develop and grow taekwondo around the world. Guinea-Bissau is situated in West Africa and its entry into the global taekwondo family reflects the ongoing growth of the sport in the continent. 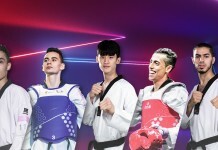 Africa hosted the Grand Prix Series 2 in Morocco in September this year and the Grand Prix Final and World Taekwondo Team Championship in Cote d’Ivoire earlier this month. As a sport which does not require any equipment, taekwondo is universally accessible to people of all ages and genders and can be easily practised in developing countries with limited sports infrastructure.